While partaking in the Cruising the Coast Festivities: enjoy some of the nation’s best Creole / Cajun Food. A family friendly establishment providing a wide variety menu to please all at Darwell’s Café. Real food for real people. Never fried. As seen on Diner’s Drive Ins & Dives (DDD), and recently named one of the top 10 restaurants in the United States by Forbes Magazine 2016. Enjoy the Cruising the Coast festival to celebrate antique classics, hot rod vehicles, and nostalgic music with Darwell’s Café (Gospel on Sundays). Darwell’s Café offers exceptional food, music daily and the opportunity to BYOB. Mingle with car enthusiasts from 41 states plus Canada and Sweden who drive to the Mississippi Gulf Coast once a year to showcase their rides and to cruise the beautiful 30-mile stretch of beachside highway (Hwy 90) with designated stops in Bay St. Louis, Biloxi, D’Iberville, Gulfport, Pass Christian, and Ocean Springs with nearly 8000 vehicles. Darwell’s Café is located between Gulfport and Pass Christian in Long Beach. A convenient location for all. 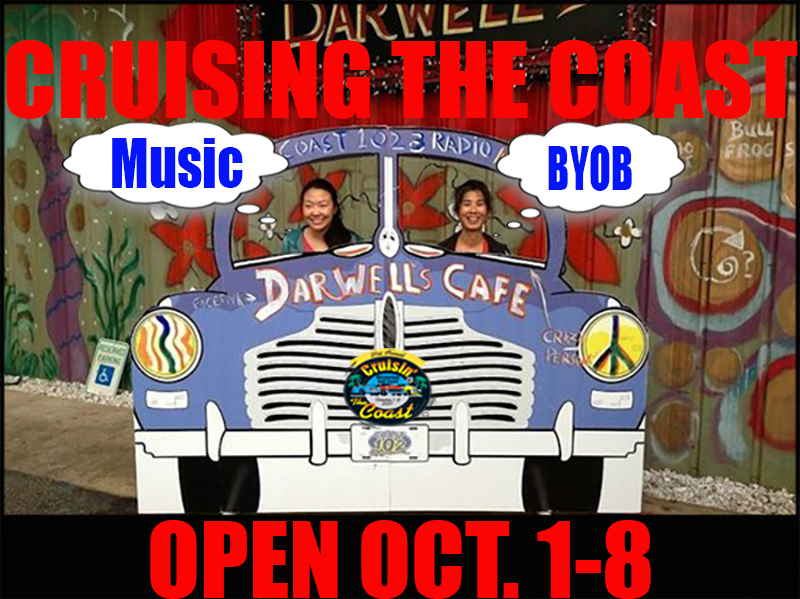 What better place than Darwell’s Café to make your Cruising the Coast a memorable lifetime experience? Laugh, sing, drink with, and enjoy DDD’s most Memorable Character “Papa D”. Listen to live music, enjoy the food, and relaxed atmosphere. Ask for a personally drawn Papa D artistic cup, and explore eclectic surroundings. Browse the art work, or ask for “Darwell & The Risk Taker Band” music CD’s, and T-Shirts available for purchase. Cruising the Coast is one of the biggest special events in the state of Mississippi and a trip to Darwell’s Café will make it complete. 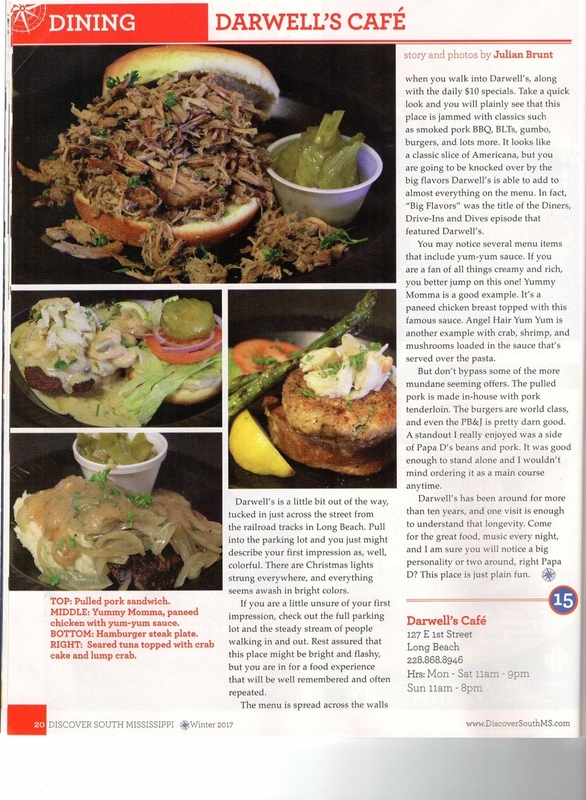 When not listening to some of the best musicians the coast has to offer at Darwell’s Café…. Why don’t you listen to doctorbobandmisskitty.com ? ….. on the road, watching the vintage vehicles go by, or at home. Nationally known “Original Comedy & Music” from Darwell’s Café located a stone’s- throw from highway 90 in Long Beach Mississippi. Great Food, Great Service, Great Music, Great People! You’ All come by…….. The scene: It doesn’t get much more laid back than Darwell’s Café, a true roadside joint that is literally on the other side of the tracks. Oceanfront Beach Boulevard is the main drag in these parts, running along America’s longest manmade beach, but Darwell’s sits off Railroad Street, which runs parallel several blocks inland, along the tracks. Long Beach, a small neighbor of Biloxi, is home to the University of Southern Mississippi, and was once known as the Radish Capital of the World. The area is now a major tourism destination, with Biloxi and Gulfport full of marinas, museums, golf courses and casinos. But while Darwell’s is very close to these, you would never drive by or find it if you were not looking for it. Nonetheless, lots and lots of people come looking for it, and Darwell’s, though much bigger than it looks, is routinely jammed with a long line out the door, especially on weekends. The main building has several inside dining rooms, and there is a vast outdoor dining area full of large tables. At maximum capacity it can hold a couple of hundred folks and often does, with live music nightly, indoor or out. As soon as you walk in you are at the counter, where the normal greeting is to ask whether it’s your first time, and if you say yes, a sample of their signature crawfish etouffee is handed to you. You order at the counter, which has handwritten specials and menu items hanging over it and on the walls on either side. Then you are handed a number, make your way to the iced tea stand to grab a beverage (it’s BYOB for adult beverages), then find a table. Food is delivered to you with the same ultra-friendly service that pervades the place. Darwell’s is funky, and the walls are covered with whimsical art, caricatures, song lyrics and cartoon-like drawings, mostly by the owner’s father “Papa D,” who is known to wander around and spontaneously draw caricatures of customers on Styrofoam cups for instant keepsakes, or pull out a harmonica and start jamming with the band. Colorfully painted guitars hang on the walls, endless strings of Christmas lights dangle from the ceilings, and it is a place of wonder at every turn. Even the otherwise barren concrete floors are whimsically painted with colorful designs. The exception is the front dining room, by the counter, which is covered with more conventional framed article clippings and awards, and a signed poster-sized photo of TV personality Guy Fieri. He brought his show Diners, Drive-Ins and Dives here specifically for the crawfish etouffee, which he loved so much he included the recipe in his DDD Cookbook. What they come for in droves is the etoufee, and it is awesome. This part of the Mississippi coast is close to New Orleans and heavily influenced by the same kind of Cajun and creole dishes, but in most places etouffee is reddish, while here it is a creamy mustard color, and comes topped with a healthy pile of blackened, spiced Gulf shrimp just for deliciousness sake. Owner Darwell Yeager III makes it entirely from scratch, going so far as to make his own crawfish stock, then adds healthy portions of butter and cream (the color) along with the so called “Holy Trinity” of Cajun and creole cuisine, celery, onion and bell pepper. There is also Old Bay crab seasoning, Cajun spice blend, garlic, flour and parsley, plus lots of local crawfish meat, a layer of white rice and the blackened shrimp, with a from-scratch house seasoning. The etouffee sauce is thick, creamy, rich and delicious, the seafood just makes it more so, and it is impossible to stop eating. The French bread served alongside is for mopping up every last drop. But as good as it is, the shrimp creole is even better, and just as to-the-very-last-drop addictive. For this dish the trinity gets sautéed in lots of butter with the same spice duo, plus healthy slices of andouille sausage, homemade shrimp stock, and tomato sauce, which is slow cooked into a delicious thick red mess. Some regulars order it as an entree over spaghetti, and Darwell’s is the kind of place where they will put together pretty much anything you ask for. The gumbo is also thick, from scratch, and very good, but the other two dishes on the sampler are so superlative it seems a little average in comparison. Lots of people share the sampler and crab melt — we were the fifth couple that night to place this exact order, and it was still early. The sandwich is uniquely rich, creamy and meaty, crab and ham making an unlikely but successful combo. While already messy, it is worth slathering it with both the house sauce and au jus for a drippy, juicy taste fest. The friendly staff, from the free samples to the smiles to the drink refills, add to a great experience. One of our waitresses told us she met her future husband here, got married here, had her reception here, and continues to love working at Darwell’s. This is one of those places where it is truly hard to go wrong — if not impossible. Everything is bursting with flavor and freshness, and is spicy in a good way, not a hot way, with layer upon layer of complimentary tastes, as with the spicy blackened shrimp providing great contrast to the creamy, buttery etouffee, or the ham offsetting the crabmeat. Even the desserts, baked specifically for Darwell’s by a local pastry whiz, are great. Prices are very reasonable, portions big, smiles bigger, food delicious, and with the BYOB, it is a great spot to eat outside as a group with a couple of bottles of wine or beer, while enjoying music. 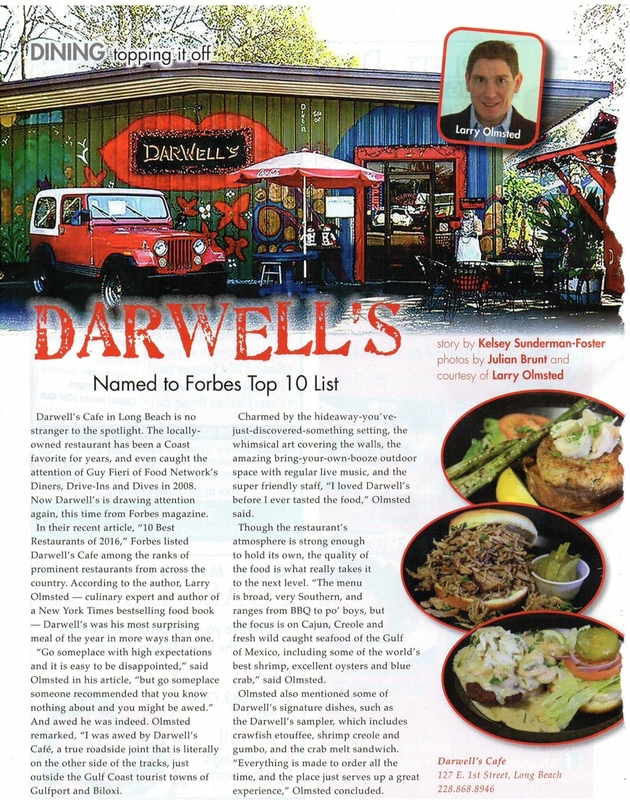 Of the hundreds of Great American Bites eateries I have visited in the past five years, Darwell’s is among my very favorites.